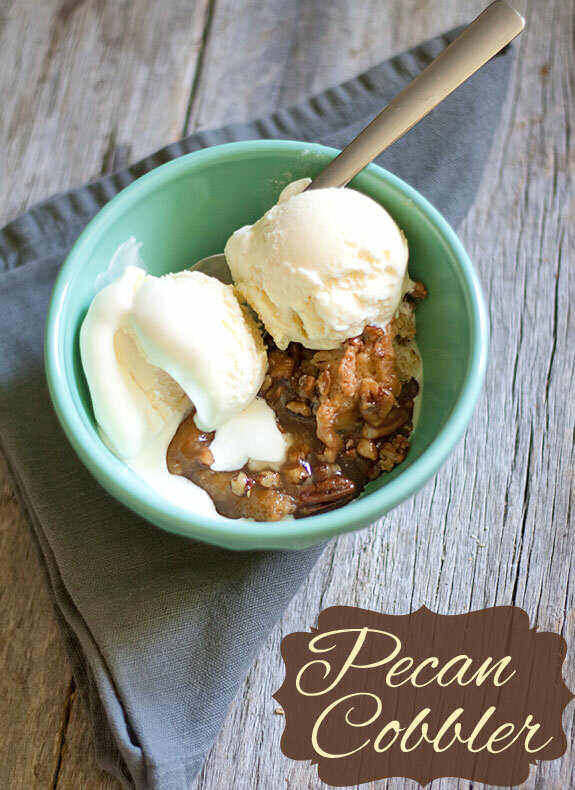 A few years ago I first encountered Pecan Cobbler at my favorite local restaurant – it was gastromical heaven. Sadly, the place closed, and I was kind of devastated at the idea of never having it again. What’s a girl to do? Figure out her own pecan cobbler recipe. I scoured Pinterest and Google, but after trying dozens of versions, I mixed and matched ingredients until I got the perfect Pecan Cobbler. If you like pecan pie, then you’ve hit the jackpot. This cobbler is about a million times better, and I’m going to share the secret of how I make it. To make pecan cobber recipe, you will need a few ingredients. In a mixing bowl, put together all of the ingredients except pecans and blend with a mixer until mixed very well. It’s going to be a syrupy mess, but it will come together and be smooth. It helps if your eggs are room temperature. Preheat oven to 375 degrees. Butter an 11×13 baking pan, then spread the crust mixture on the bottom of the dish. Sprinkle the pecans evenly over the top of the crust. Then pour the filling all over the top of the pecans. Bake for 45 minutes to an hour, or until golden and bubbly. Cool for at least 30 minutes before serving – it is like lava when it first comes out of the oven. Warning: If you make this, you will become addicted – which means more time at the gym. 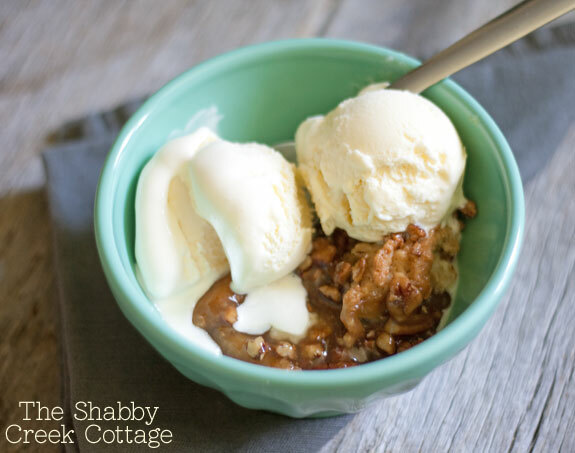 You’ve been warned 🙂 Or better yet, make it for family get-togethers – you’ll become the Pecan Cobbler queen! In a mixing bowl, put together all of the ingredients except pecans and blend with a mixer until mixed very well. It's going to be a syrupy mess, but it will come together and be smooth. It helps if your eggs are room temperature. Preheat oven to 375 degrees. Butter an 11x13 baking pan, then spread the crust mixture on the bottom of the dish. Sprinkle the pecans evenly over the top of the crust. Then pour the filling all over the top of the pecans. Bake for 45 minutes to an hour, or until golden and bubbly. Cool for at least 30 minutes before serving - it is like lava when it first comes out of the oven. I can’t wait to try this, Gina! It looks delicious! I make pecan pies all the time for family gatherings. I can’t wait to bring this to the next function! Just pinned it, too! Thanks!!!! What type of pan do you use? The only thing I have that big is a jelly roll pan. Thank you! It’s an 11 x 13 – sorry about that! Thank you so much for this recipe! I had a little bit of a time with the crust since I don’t have an actual food processor. I used our Ninja Blender thing-a-ma-jig. 😛 It came out great! Everyone was very pleased and couldn’t resist having another serving. I reallly want to try this but i dont have a food processor?? whats a girl to do? You totally could, but you’d have to add in baking soda to help it rise. Ok! I will try it. Thank you! Do you mean a 9 x 13 pan? That’s a common size. I don’t know of an 11 x 13. First of all, pecan pie ingredients cannot make a bad dish. Made this in a 9 x13 pan and then cleaned the huge mess out of my oven. Use an 10 x 15 pyrex or equivalent. I will probably make again, but didn’t care for the ground oatmeal and will use slightly sweetened biscuit dough made out of good ol’ Bisquick. Pamela, did he possibly eat at Bartley’s in Grapevine, TX? 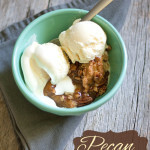 I just got home from a business trip and am scouring recipes to find something like the pecan cobbler I had there. I’m wondering if you have made this and is it close to what he had. On the butter…..do you use unsalted? I’m always confused on what butter to use for things like this and making cookies. Gina, hi , I am Pam, a 100% Southern grandma who absolutely LOVES your site. I get your daily mail and enjoy all of the recipes and decor ideas. But I have a question…….why does your site not have the Pinterest symbol? (Or have I missed it?). I want to make a Shabby Creek board, thus giving you credit and giving me a place to store your recipes, ideas, etc… Thanks in advance for answering me. Feel free to answer directly to my email. Thanks so much Pamela, I sent you an email with my Pinterest information. There is a Pinterest button on my site, it is in the upper right corner of the homepage 🙂 Have a wonderful weekend! Thanks for replying so quickly! I knew it had to be me that overlooked it !!!!! Now I can spend a couple of days getting my “Gina Luker fix” on as I set up a Shabby Creek Pinterest box on my Pinterest page!! !